Night Moves with DJ Ren, Dean Dixon, and Archie. Night Moves returns for its weekly serving of after-dark sounds on the Beach Club’s intimate bar deck this Saturday 30 September. 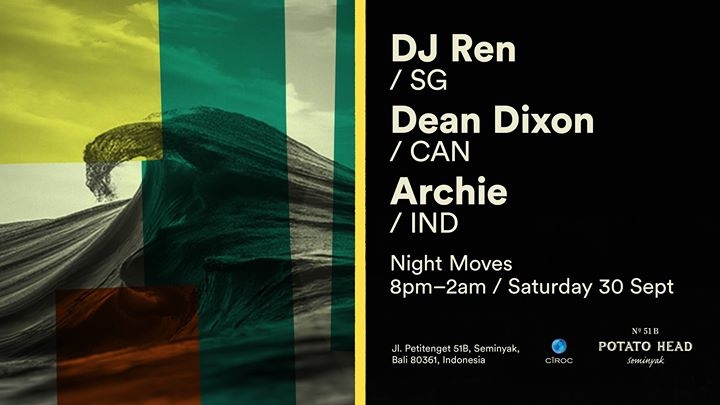 This week, DJ Ren (SG), Dean Dixon (CAN), and Archie (IND) will be behind the decks at Potato Head's up-close-and-personal bar deck area. A well-known figure in the Singapore music scene, Rén has graced the decks of clubbing institutions like Zouk and Velvet Underground (Singapore), Club Renaissance (UK) and the legendary Pacha in Ibiza. His deep-rooted passion for electronica and uncanny ability to drop a wide spectrum of quality sounds promises to satisfy the most discerning of music lovers. Originally hailing from Canada by way of Australia, Dean Dixon’s DJ style espouses diversity. He wholeheartedly believes there’s great music in every genre and takes great joy in sharing his worldly treasures with others. Archie started spinning records at house parties in 2009. Since then, he has stepped up to the international stage, playing alongside tastemakers like LeFtO, Dâm-Funk, Onra, Detroit Swindle and Grammy-winning StaRro (Soulection). A DJ who has dropped genre-bending sets in various venues, Archie also runs the tri-monthly SCRUBS! with Jakarta's other rising selectors. FDC IDR 100k inclusive of one drink.